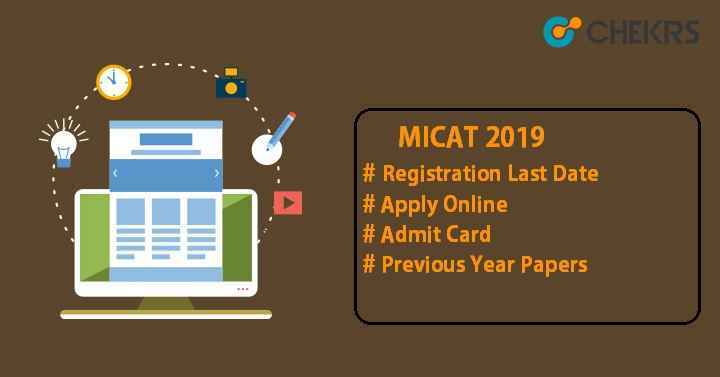 MICAT 2019: Mudra Institute of Communication (MICA), Ahmedabad conducts the MICA Admission Test (MICAT) twice in one year. This entrance test will be organized to provide admission to PGDM-C (Post Graduate Diploma in Management-Communications) course. Latest Update: MICAT – II Registration will be open on Thursday, December 20, 2018. More events and their schedule is Listed in the table below. Applicants who appeared in MICAT test two times, then the best of both exam scores will be accepted. Candidates must have to take any one of these exams CAT/ XAT/ GMAT to appear in the admission test held by MICA. The official authority of MICA will release the MICA Application Form through online mode. Here we are sharing the basic information with you. You are advised to go through the article to get all the details about MICA Admission Test. Check the expected exam dates of MICA Admission 2019 here. There is no age criterion for candidates who will give the MICA entrance examination. Candidates must have passed (10+2+3) bachelor’s degree from any recognized university or institutes. Foreign candidates can also apply but they must have valid passport. Candidates appearing for the final examination of any Bachelor’s degree will be eligible for the MICAT. Applicants having valid score card of CAT 2019/ XAT 2019 or GMAT can also apply for this entrance test. Candidates who want to appear in the MICA admission test can apply online. The application form will be available on the official site of MICA. The official authority will commence the MICAT Registration Form in the month of January. Go to the official portal of MICA. First register yourself by clicking on the button “New Registration”. Then login in to the account with the details required and then click on the option “Go to Application Form”. Fill the application form with other personal details, educational details, address, etc. Upload the clear & recent scanned photograph. Pay Rs.1965/- as application fee through online mode such as net banking/ credit card/ debit card. Section-I Descriptive Test Creative writing skills will be checked. Verbal Ability Visual Reasoning, Data Sufficiency, Statement-Conclusions, Word Combination, etc. Section-III Psychometric Test In this section, candidate’s behavior will be checked. Candidates have to describe their behavior in the best way by selecting any one of the given options. The previous year question’s paper gives the overview of the questions asked in the MICA admission test. Students can get the MICAT Sample Paper from the official site and practice it to get good score in the entrance exam. Students must try to attempt mock test for better performance in the exam and also to improve the speed and accuracy. Read only the best author/ publication books. Go through the complete syllabus. Read Newspaper on regular basis. MICAT Hall Ticket will be available on the official website. Candidates who will register themselves successfully, can download their admit card. It will be mandatory to carry the admit card while appearing for the exam. Click on the link given to download the MICA Admit Card. Enter the asked details like User Id & password and click on the login button. After login into the account, Admit card will be displayed on the screen. Take the print of hall ticket in order to get entry in the examination hall. The result of entrance exam will be declared through online mode only. All candidates who will appear in the exam can see the MICAT Score Card from the official websites. Visit the MICA official portal. Click on the link available there to download the result. Login to the user account and then submit it. Download it and take the print for further use. To be eligible for the further round i.e. GE or PI rounds, candidates will have to obtain the minimum score decided by the MICA. MICAT Cutoffs will be decided on the various aspects like previous year cutoff, seats availability, no of candidates appeared in the exam, difficulty level of question paper etc. Candidates who gave both MICAT exams, the better score of the two will be considered for the admission into MICAT. On the basis of CAT/ XAT/ GMAT score, MICAT score or can say Psychometric test marks, the official authority of MICA will prepare the MICAT Merit List. Candidates, whose name will be listed in the prepared merit list, will be called for Group Exercise & Personal Interview rounds.